How many of us have a huge pile of fat quarters that you don't know what to do with? You can cut these fat quarters into the popular pre-cuts that fabric shops are offering to make quilts and use them that way. Popular sizes are layer cakes (10" squares), charm packs (5" squares), and jelly rolls (2 5" x 44" strips). Precut fabrics are the biggest trend these days in the quilting world. If you already have fat quarters or yardage - make your own! As most of you know, fat quarters are a quarter of a yard. But, instead of cutting 9" the width of the fabric (WOF*), it is 18" cut WOF, then that is cut in half. In other words, this is a half yard cut in half lengthwise and then crosswise. 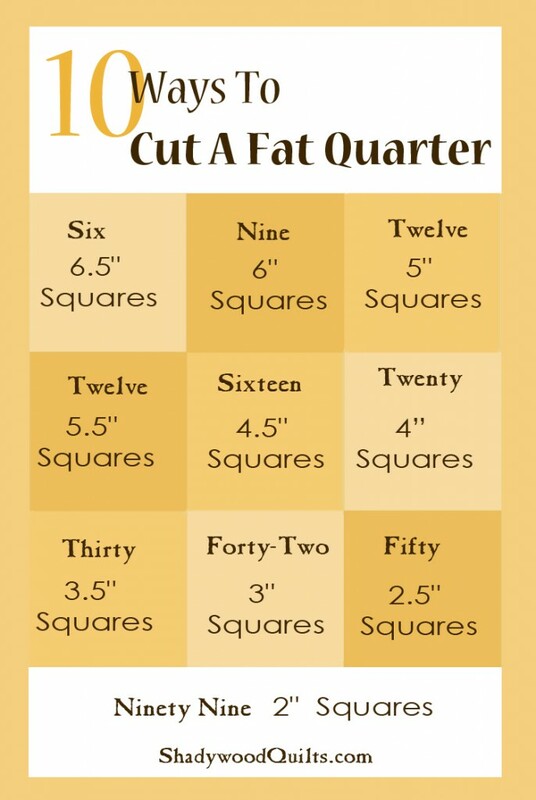 The fat quarter should be approximately 18" x 22". Shadywood Quilts/T-Shirt Quilts of Texas is a full service professional business that can help you complete your quilt at most any stage. We also 'fix' quilts made by non-professionals. If you get started, and don't feel you are going to be able to complete your quilt. Take pictures of your quilt in process, email it to us, and we can let you know if we can help you get it finished.